As the 4 hour opening London 2012 Olympic ceremony opened tonight the media was concentrated on the display of England's history being played out in the Olympic stadium rather than the mass protests being held around London. As Danny Boyle the director of Trainspotting delivered a history of England from the "green and pleasant land" to the industrial revolution. Which included historical as well as fictional characters including Mr Bean and James Bond who "parachuted" down to the arena along with Queen from a helicopter as British musicians played tunes from punk to dubstep and Rave to Grime to the crowd. Music most people outside of the UK had probably never heard of but which apparently showed off our sense of culture and Art which has replaced our once huge Empire after the 2nd World War. However as the TV viewers were fixed to the screen and watching giant chimneys rise from the ground and clouds rain on the ground, volunteer dancers and actors playing their parts in the history of Britain and much more there were actually mass protests being held around London. The protests used the hashtag #Criticalmass on Twitter and delivered messages about Police brutality as the cyclists protested the blocking of roads and cycle lanes within central London so that they could be used by Olympic dignitaries only as "fast tracks". Apparently during the London Olympics it is more important that David Beckham can reach the worlds biggest McDonalds in super fast time whilst the rest of London's population are stuck in traffic jams. Critical Mass is a cycling event typically held on the last Friday of every month all around the world. Earlier there have been calls on the Internet to stage the London ride on July 27 as an anti-Olympics protest. Scuffles occurred near the Olympic Stadium on the outskirts of the Olympic Park with participants saying they were being “kettled”. Some witnesses said police pushed the cyclists aside to get David Beckham through traffic. A witness video uploaded to YouTube allegedly showed police assaulting and pepper-spraying a disabled man on a tricycle who was later arrested. 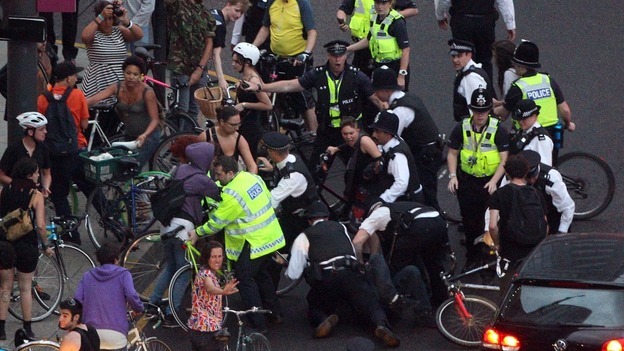 The Police told ITV News that a number of protesters were arrested under section 12 of the Public Order Act after cyclists taking part in the Critical Mass bike ride broke the conditions of their protest in Central London. According to some reports at least 50 people have been detained and their bicycles loaded onto special buses parked nearby to be taken god knows where. The Metropolitan Police have also used Pepper Spray on a number of protesters as well as arresting a large number of them including the disabled and the elderly. However the media were silent on these protests on the main channels as the BBC turned their main channel into an Olympic love fest all night long which only finished after midnight, with Paul McCartney singing on a piano to the packed arena. 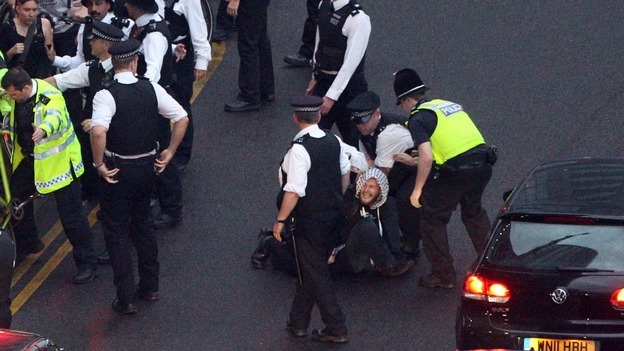 The London Police kept the public informed about the protests and the likelihood of arrest through the use of Twitter and Tweeted a number of messages warning the public about the likelihood of arrest if they turned up. They also used the hashtag #criticalmass and some of their messages are below. Just another sign that when it comes to big money and sponsors versus civil rights and the right to protest the citizen is always bottom of the list.